Human Risks is an online platform that guides you through the entire risk management process. Our integrated and automated features provide you with an overview of your risk assessments, mitigating measures, incident reports and internal audits. As an organisation, you have to safeguard your most valuable resources; your employees, your assets and your reputation. Not only because of the moral obligation, compliance with standards as the PAS3001 (duty of care) or PAS200 (crisis management) but also because it creates value for your customers and therefore your business. Risk management is a question of prioritising resources. That prioritisation should be done on an informed basis where facts and lean, automated processes ensure alignment with your business strategy, while optimising resources and the effect of mitigating measures in your organisation. Our platform simplifies and automates a traditionally cumbersome and ineffective risk management process. Mitigating measures can be automatically matched with threats in your assessments, saving you time and making sure risks are managed consistently across your organisation. We provide a selection of relevant mitigating measures developed by risk professionals as part of the platform and you can, of course, also create your own. Our online platform enables you to involve relevant stakeholders and document the process ensuring a complete audit trail in compliance with the ISO31000. A part of our platform is an incident report module. Data on previous incidents is key to establishing preventive measures so your organisation is proactive rather than reactive; avoiding future incidents rather than just treating the symptoms. Our platform is designed to integrate with live information sources and we provide our clients with several different data feeds from external vendors. 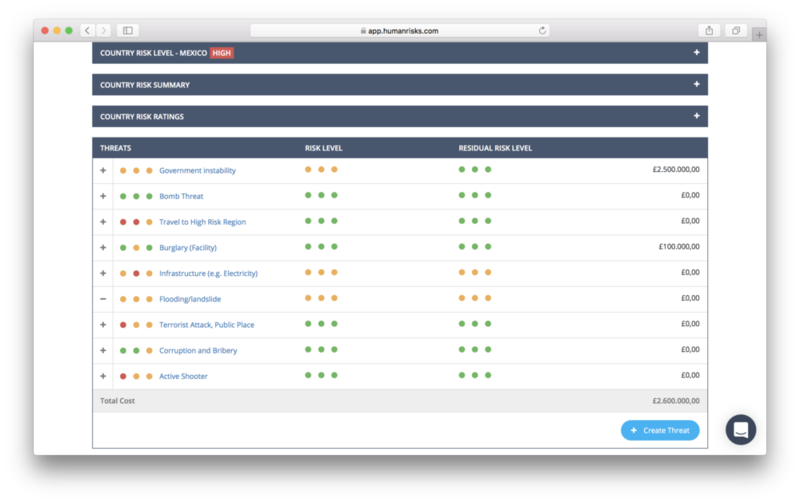 One example of intelligence keeping our users automatically updated on existing and emerging threats are the global security incident updates, country risk summaries and country risk levels from Riskline. 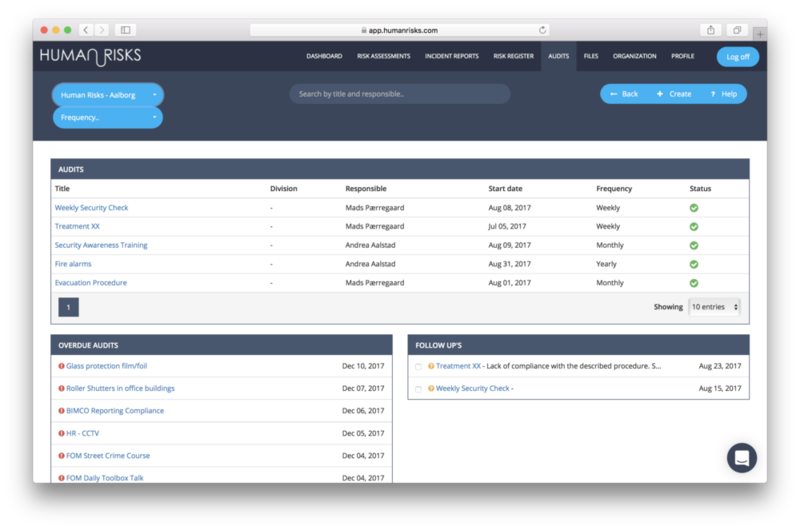 Our incident reports module allows you to filter the entire 50.000+ security incidents already available. Intelligence - filter and search in our database of 50.000+ security incidents. In your risk assessment, you can subscribe to external and/or internal security incidents within a set distance from your chosen asset and we will keep you updated about relevant security incidents as they happen. Stay updated on future security incidents relevant to your asset. Create an audit: any task that has to be carried out on a recurring basis (daily, weekly, monthly etc.). Describe the task using text, links and video and assign a responsible employee or external vendor to carry out the recurring task. Create an audit; describe and delegate it and the responsible employee will be notified via mail, SMS or push notification in the mobile app. The platform's audit module gives you an overview of all tasks and whether they have been completed on time. If there is anything that management needs to follow up on they are notified instantly. Audits can be completed via our mobile app, which is integrated with the device's camera and GPS for easy documentation and a fully evidenced audit trail. Total overview of all audits; overdue audits are clearly marked and "followups" are ready to be checked! The dashboard provides the user with an overview of; risk assessments, incident reports, overdue and upcoming deadlines, high-level risks, mitigation implementation level and financial costs. The dashboard consists of a number of tiles each showing tailored information about the current state of security risks in the organisation. The platform automates the risk management processes, helps decision making and hereby saves resources. That said, Human Risks believes in and encourages human advice as well. As part of the platform service, human support is always just a click away. What's more, Human Risks can help facilitate your risk management process through workshops, internal training or by producing risk assessments for your assets on your behalf. Go back to home, read our blog or sign up for a free trial.